Research and experience are the key to innovation: our goal is to find new ways to relate them to the companies’ daily activities and their growth path. NTP hosts Laboratories and Research Centers. 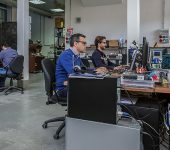 The research center was born from the collaboration between the University of Pisa, NTP and other innovative companies in order to speed up the chain process in the telecommunications filed. Find out the CUBIT objectives and proposals..
NTP hosts the biggest Laboratory for Digital Fabrication in Tuscany! 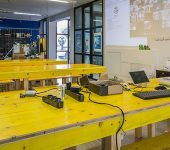 Thanks to shared tools and processes, it is possible to implement any project and share it with the network of Fab Labs all around the world. Each FabLab has access to a shared inventory where it is possible to find and share all the materials needed for projects. The machines are controlled by free software tailored to the needs of digital fabrication. The lab is open to all and it organizes several activities and workshops both for children and adults. The Interdepartmental Research Center “E. Piaggio” is an Institute of the University of Pisa, whose activities aim at promoting and carrying out interdisciplinary research in the fields of Bioengineering, Robotics and Automation. The Centre co-operates with public and private companies in order to find solutions to specific problems that require advanced or innovative solutions. Find out how the center operates and the main areas of interest. Find out how the center operates and the main areas of interest.